Best Deal in Aspen- Near St. Regis & Lifts - Aspen Mountain. This bottom-floor spacious unit has a view of Ajax/Aspen mountain. It is on the bus route and a short walk to Lift 1A, the Gondola, and the St. Regis Hotel. Master bedroom has two queen-size beds with a view to Red Mountain. Guest room has a queen size bed. If you love Aspen and all of its amenities, this two-bedroom, two-bath condo is the perfect vacation rental. You will find this unit brings you the best of everything: location, convenience, and cozy, affordable accommodations. Timberridge Condo 1G is in the heart of downtown Aspen, just minutes to the Gondola and a two minute stroll into Aspen’s busy shopping and dining areas. With its fully equipped kitchen, this unit is the perfect, cozy spot for après ski dining. Or if your ideal vacation includes a busy nightlife, Aspen is just beyond your front door with its renowned restaurants and bar scene. The unit has a warm and cozy atmosphere and is decorated in a Western style. It is located in a quiet area near downtown. One car parking is available with permit. There is a free RFTA bus from the airport to Ruby Park in the center of Aspen. There is a CME bus from Eagle (EGE) Vail airport or Denver (DEN) airport. Denver is 3-4 hours driving time, Eagle is 45 mins, and Aspen (ASE) airport is 10 minutes. I have owned this condo for several years and it is my home away from home. I am a Broker Associate in the real estate business in the panhandle of Flordia in the town of Destin. Why John Gillespie chose Aspen Mountain. It is the best deal for the money in the downtown Aspen area. 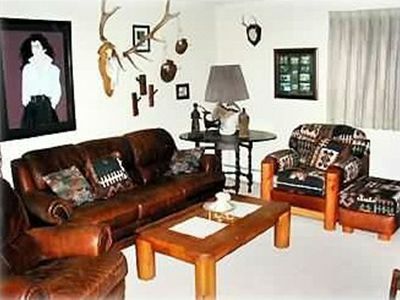 I enjoy this condo because it is in the downtown part of Aspen but yet it is located in a very quiet area. A car is not necessary as all of the dining and shopping facilities are nearby. Walking distance to all city center shopping, eating and local bars. Spot for one car with permit. Bar area for dining plus fold out table. In living area and bedrooms. Condo is in a great location, walking distance to a lift, the gondola and tons of great bars, restaurants, and shopping. It is stocked with everything you need for eating in, it's comfortable, cozy, and well appointed. The owner is very available/communicative and easy to work with. Plus, the price/value is very reasonable compared to other rentals in the area. Thanks for the great stay, we will definitely return to this property next time we are in the area. Thanks for the great review on my Aspen condo. We loved our stay in this cozy condo! It is in the perfect location where we could walk to everything in downtown Aspen. The condo is very cozy and the beds are nice and comfortable. We had everything we needed for a wonderful holiday getaway! Thanks so much for the positive review - Pati and I appreciate it as she has worked hard to upgrade and make the condo nice and comfortable for all. We were very impressed with the condo. The location is perfect only 5 minute walk to a chairlift and under 10 to the gondola and bus station. They had all the amenities we needed including laundry and fully stocked kitchen. Appreciated the humidifiers in each room due to the very dry climate. Place looks better than it does in the photos. Nice to be the first floor so you don't have to bring skis and luggage upstairs. Hope to book again for next year. Good location. However, when I showed up the condo wasn't ready and appeared as if the previous tenants were to return soon. I had make up the condo myself and clean bathrooms and kitchen. Owner did call the following day and condo was cleaned but didn't overall feel comfortable. Said he would refund some fund but haven't received as of 3 weeks. First time in 10 years that my maid did not get the unit cleaned between rentals due to unavoidable circumstances. Upon receiving a call from renter (one man) the evening of check-in, the cleanup was expedited the next day. After finally receiving renters mailing address, money was refunded for his inconvenience. I was surprised on receiving negative feedback from this renter after resolving his two complaints especially as he did not contact me to let me know he was leaving negative feedback. I am always willing to resolve rental problems and I am willing to work with all renters on any problems. The condo is a lot nicer than the pictures posted. I think it might be time to post some updated, clear pictures, as well as including bathrooms etc. The place is very clean, well equipped, and in a great location. You are walking distance from town, near a park, and really don't need a car. The bathrooms are small, but very clean and super functional. The bedrooms are a little dark but the beds are fine and everything works well. The reason for the three stars is that we were in the midst of a construction zone. Currently 3 big condo complexes are being built right next to Timber Ridge. Unfortunately the view out of the living room is now pretty obstructed by near-by new construction. No more beautiful views of the mountain... little slice of Ajax is visible. We did not spend too much time indoors so we were not really bothered by all this. Great value for money. John is very easy to communicate with. We had no trouble at all. We would definitely stay here again. Thanks John for sharing your home away from home. For Christmas this year, I took my twin 19y/o sons to Aspen. This unit was just perfect. Both bedrooms have their own bathroom and neither one is any better than the other. There are plenty of full length mirrors in the bathrooms and throughout the unit to check your style :) The guest bathroom has really bright lights for ladies makeup. Both bathrooms have hair dryers for those of us with hair. The beds were comfy and the sheets silky. The unit is located on the bottom floor and runs the full depth of the building. Its quiet and convenient to get in and out of. The kitchen is fully equipped if you wish to cook. Essential staples are there like coffee filters, baggies, garbage bags, TP. No car is needed. We rode in from Denver on the Colorado Mntn Express (CME). Its a long ride but comfortable. Rent your gear from 4 mountain sports. They are conveniently located at the base of each of the 4 mountains. Buttermilk is just about the only one with any green slopes. We spent our time on Aspen Mountain, Highlands and Snowmass. There are some terrific runs. 4 Mountain will store your skis each night and transport the between mountains. I carried my ski boots and wore my walking boots on the buses between mountains . Just store your walking shoes at 4 mountains. Its all so easy. Rubey park is where you pick up the buses between mountains; its all free and the buses come ever 6 or 7 min during peak times. Loads of restaurants within .2-.3 mile walk. Even with it being cold out, we walked everywhere. My condo is located is the quiet section of Aspen within walking distance to both ski lifts, shopping and eating. Bus station is nearby with connections to the surrounding ski mountains. Deposit to be returned if booking canceled 90 days in advance.